Pilot of 118 Squadron and de Havilland Test Pilot. 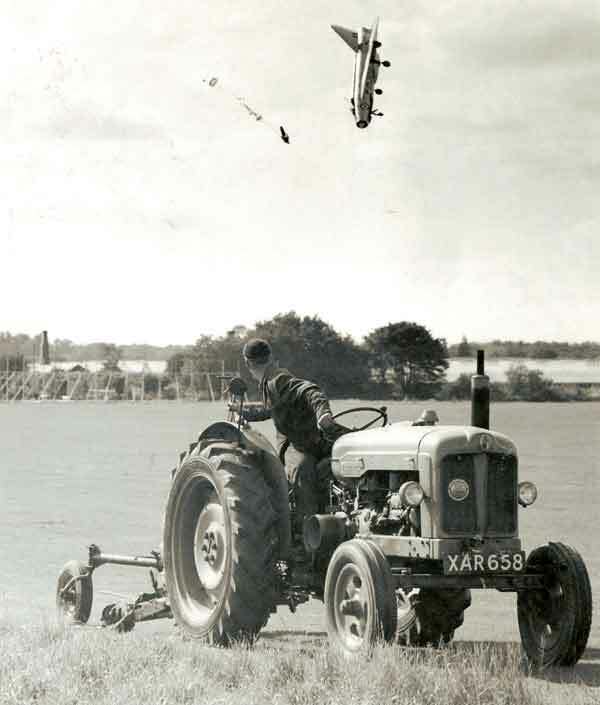 Mr G P Aird AFC a test pilot with the He Havilland Aircraft Company, ejecting from Lightning P1B XG 332 on 13 September 1962. He was on finals for an emergency landing at Hatfield, following A double reheat fire warning occurred about 15 miles North East of Hatfield. George was making a normal powered approach, unfortunately he had to position for runway 06 as the wind was from the northeast. His approach to Hatfield was from the NE. The runway was short by Service standards so the manually operated barrier had been erected at the northeast end of 06. At about 10 seconds from touchdown, at about 100 ft, the aircraft suddenly pitched nose up and, since there was no response to the controls, he ejected. The aircraft crashed on the airfield, broke up and caught fire. 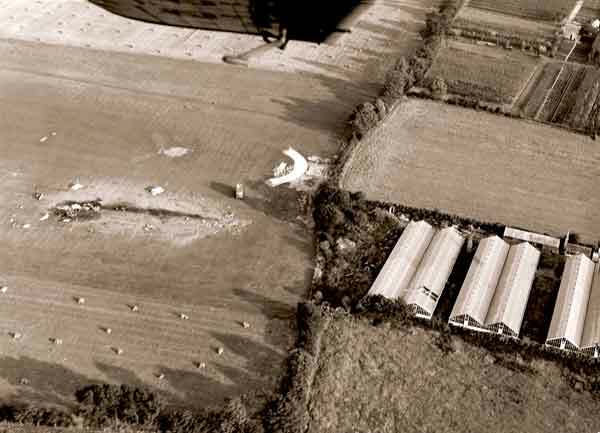 The wreckage of the Lightning can be seen above just on the airfield short of runway 06 and just beyond the greenhouses in which George landed. Fire damage was the cause of this accident; the anchorage for the tail plane actuator jack had burned away, hence the loss of elevator control. George landed in a greenhouse sustaining several fractures. The hole where George and the ejection seat went through the glass roof can be seen in the above picture in the near end of the roof of the second greenhouse from the left. They landed in adjoining rows of tomatoes! The damage at the far end of the greenhouse was made by the arrival of the Lightning canopy. The remains of the Lightning can be seen on the left just into the airfield. George was back flying again within six months and on Lightnings a year after the accident. George retired from de Havillands (British Aerospace) in 1983 but continued executive and airline flying until his 65th birthday in 1993. He now has an NPPL. Jim Meads is the man who took the picture. He was a professional photographer who lived near the airfield, next door to de Havilland test pilot Bob Sowray. So, the story goes: Bob Sowray mentioned to Jim Meads that he was going to fly the Lightning that day. When Meads took his kids for a walk, he took his camera along, hoping to get a shot of the plane. His plan was to take a photograph of the children with the airfield in the background as the Lightning came in to land. They found a good view of the final approach path and waited for the Lightning to return. As it happened, Bob Sowray didn't fly the Lightning that day. The pilot was George Aird, another test pilot working for De Havilland. George Aird was involved in the Red Top Air-to-Air Missile programme and seems to have been a well-respected test pilot. I found a video of Aird in 1984 preparing and flying a DH Mosquito RS712. It's one of the few videos I've seen that shows as much of the pilot as the plane! But let's get back to the story of the photograph on the 19th of September. That day, George Aird was in the Lightning doing a demonstration flight off of the south coast. He was approaching Hatfield from the north east when he realised there was trouble. Whilst carrying out a demonstration flight, there was a fire in the aircraft's reheat zone. Un-burnt fuel in the rear fuselage had been ignited by a small crack in the jet pipe and had weakened the tailplane actuator anchorage. This weakened the tailplane control system which failed with the aircraft at 100 feet on final approach. The aircraft pitched up violently just as Aird was coming up to land. Aird lost control of the aircraft and ejected. Luckily, because the nose pitched up he had just enough time to eject. The tractor in the photograph was a Fordson Super Major. If you look closely at the grill, you'll see it reads D H Goblin, as in the de Havilland Goblin jet engine. The tractor driver was 15-year-old Mick Sutterby, who spent that summer working on the airfield. He wasn't posing for the camera. In fact, he was telling the photographer, Jim Mead, to move on, because he shouldn't be there. Mead saw the plane coming in and the nose pitch up. Then Aird ejected and Mead says he had just enough time to line up the shot as the Lightning came down nose first. Here's an email from Mick Sutterby the tractor driver, sent to John Palmer, which was posted on The Funny Noise. I followed my father into work at de Havilland, Hatfield in 1954 when I was 15. My father was the foreman in charge of the aerodrome and gardens. 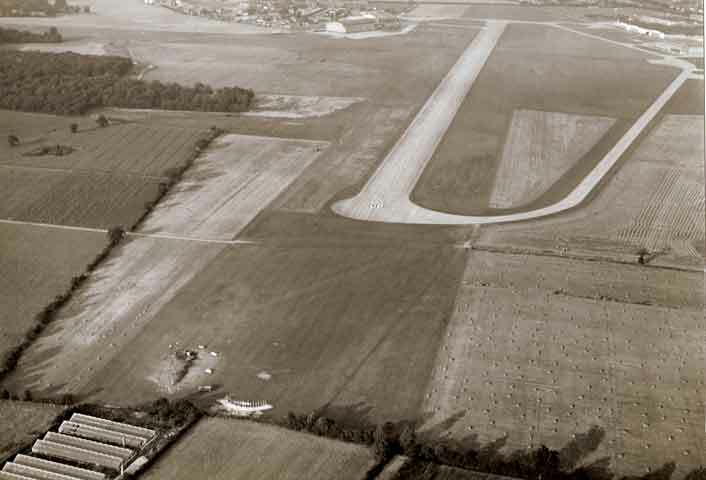 My job in the summer was gang-mowing the airfield and at the time of the crash in 1962 the grass had stopped growing and we were trimming round the 'overshoot' of the runway with a 'side-mower'. I stopped to talk to a chap with a camera who was walking up a ditch to the overshoot. I stopped to tell him that he shouldn't be here, I heard a roar and turned round and he took the picture! He turned out to be a friend of the pilot and had walked up the ditch to photograph his friend in the Lightning. I saw some bits fly off the plane before it crashed but it was the photographer who told me he had ejected. There was not a big explosion when it crashed, just a loud 'whhooooof'. I was about 200 yards from the crash scene. I saw men running out of the greenhouses and checking the scene of the crash. The works fire brigade were on the scene within a minute. Somewhere at home I have a picture of it burning. Although the picture shows it nose diving to the ground, in fact it was slowly turning over and it hit the ground upside down nose first. I was later told that if the pilot had ejected a split second later he would have ejected himself into the ground. I was very lucky. If I had known he was coming into land, I would have been positioned near the ILS (Instrument Landing System) aerial which was only 20 yards or so from the crash site! I believe the photographer had his photo restricted by the Air Ministry for - I think - about 3 months because the plane was secret. He then took it to the Daily Mail who said it was a fake. The photo was eventually published by the Daily Mirror. From there it went round the world, and I remember seeing a copy in the RAF museum at Hendon. I recollect the photographer usually photographed hunting scenes for magazines like The Field. I recollect that the pilot broke his legs but really was very lucky. I hope this is interesting. All from memory! Meanwhile, George Aird landed on a greenhouse and fell through the roof, breaking both legs as he landed unconscious on the ground. The water from the sprinkler system for the tomatoes woke him. He's reported to have said that his first thought was that he must be in heaven. The photographs taken that day first went to the Ministry of Aviation. Once they were released, Mead sold them to the Daily Mirror. It was featured as a centre page spread in the newspaper on the 9th October 1962. Jim Meads is a Mirror reader who was trying to amuse his two children, Paul, 4, and Barry, 3, by taking a picture of them as the Lightning was coming in to land at the De Havilland airfield near their home at Hatfield, Herts. The Daily Mirror paid Mead £1,000 for the rights to the photograph: £18,000 by today's standards. In my opinion, he deserved every penny.